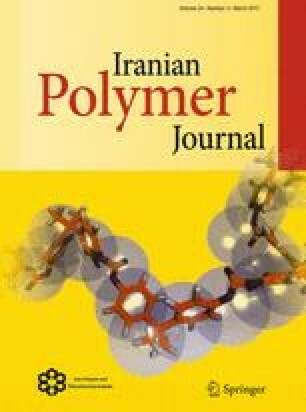 Cure characteristics, mechanical and morphological properties of natural rubber/virgin acrylonitrile–butadiene rubber (NR/NBRv) and natural rubber/recycled acrylonitrile–butadiene rubber (NR/NBRr) blends were investigated. The properties of NR/NBRv and NR/NBRr blends were studied at five different ratios of virgin and recycled NBR content [i.e., 95/5, 90/10, 85/15, 75/25, 65/35 parts per hundred rubber (phr)]. The blends were processed on a two-roll-mill and a fixed amount of carbon black was also incorporated. Results showed that scorch time (t s2) and minimum torque (M L) increased with increasing virgin and recycled NBR in both the blends. However, cure time (t 90) and maximum torque (M H) showed decreasing trend for the NR/NBRr blends and increasing trend for the NR/NBRv blends. Tensile strength and elongation at break (E b) decreased with increasing virgin and recycled NBR content. M100, M300 (stress at 100 % elongation and 300 % elongation) and hardness significantly increased, while resilience decreased with increasing the virgin and recycled NBR content. The scanning electron microscopy study indicated that recycled NBR exhibited a weak interaction with NR matrix, particularly when more than 15 phr of recycled NBR was used, thus decreasing some of the mechanical properties of the NR/NBRr blends. Overall results show that the NR/NBRr blends have good properties such as cure characteristics, hardness, M100, M300 and swelling properties compared to the NR/NBRv blends. One of the authors (H.S. Ahmad) is grateful to Ministry of High Education Malaysia for the financial support under MyBrain15 (MyPhD) Programme for her PhD study. Also, the author would like to express her gratitude to the USM for supporting most of the facilities and instruments used in this work.